Created with fine aromatic Virginia, burley, and other premium air-cured tobaccos, Red Cap Pipe Tobacco continues a long tradition of satisfying sophisticated smokers dating back more than 95 years. 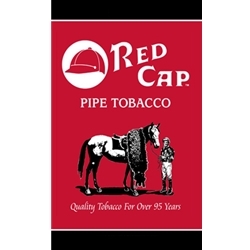 Red Cap Pipe Tobacco offers two distinctive high quality tobacco mixtures, the Regular Blend is a full-bodied blend of aromatic Virginian and Burley tobaccos. Red Cap Blend #7 builds upon the Regular Blend by adding just a hint of exotic Cavendish. Red Cap Pipe Tobacco is ribbon cut rather than a shag as are most pipe tobaccos, and suitably blends well with other tobaccos. An excellent mixture that stays lit easily offering an all-day smooth and mellow taste, with pleasant aromatic room notes. A solid value as a pipe smoker’s best friend. Try Red Cap Pipe Tobacco today and have a truly unique smoking experience. Red Cap Tobacco is produced and distributed nationwide by National Tobacco Louisville, KY USA. Each pouch of Red Cap Pipe Tobacco are available at our online tobacco store in unique styles to choose from. Available in Red Cap #7 (Smooth), and Regular Blend. Our online pipe tobacco store offers great deals and inexpensive ways to save money on over-prices retail brands. Red Cap Pipe Tobacco can be the right choice for your smoking needs. Here at Smokers Discounts we’ve made it easy and affordable to buy pipe and smoking tobacco online. Call us for more details!